Depending on the manufacturer, size and style of your waterbed it can weigh up to 2,000 pounds when the bladder is full of water. Therefore, basically, your waterbed must be drained in order to move it to a new location in either your home or when you are preparing to move to a new house. For people who are settled in one home and don’t intend to move much you may decide not to purchase a waterbed pump or drain and fill kit, as you will rarely use it. Younger people who tend to rent their abodes and move at the end of their lease period may want to invest in a pump for draining their bed. 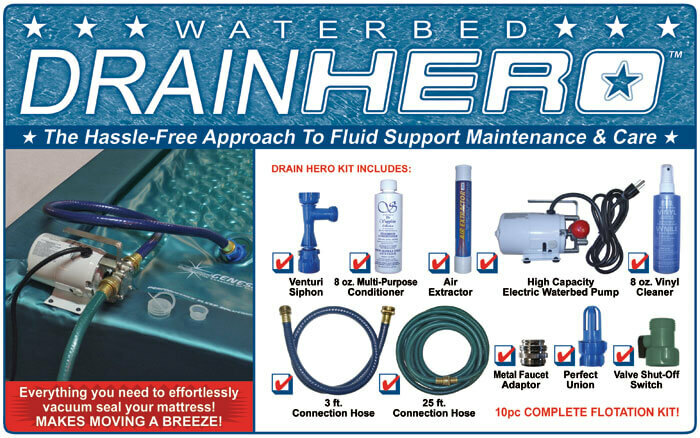 It is possible to drain your waterbed without a pump by enlisting your garden hose, an inexpensive waterbed hose adapter and using the earth’s gravitational pull. Remove all of your bedding, sheets and the mattress cover off your waterbed to expose the mattress. Unplug your waterbed heater if you use one with your bed. The heater is water-cooled and it could be damaged if you don’t disconnect it before draining the bed. Locate your fill and drain valve at the foot of your bed. Place a towel on the floor underneath it for good measure to catch any water drips. Open the plug and burp all of the air out of the mattress. If you are draining the bed by yourself and don’t have a helper sweep a broom from the head of the bed to the foot to move the air bubbles to the plug. Immediately after removing all air bubbles through the plug, replace the cap so air is not allowed back into the mattress. Place your garden hose with the end that connects to the spigot out of a window close to the ground. Aim the opposite end of the hose out of the window and anchor it in place with a heavy chair. Connect the hose to the outdoor spigot and allow the water to run until you see a steady stream of water coming out without any spurting sounds and then turn the spigot off. This step removes all of the air from the garden hose. Go back inside and attach the waterbed hose adapter to the hose. Open the mattress valve and quickly attach the adapter to the valve. Go outside and remove the hose from the spigot. The natural gravity will make a siphon out of your hose and drain your waterbed mattress for you. Place a few heavy objects such as books or any other items without sharp edges on each side of the valve to depress the valve lower than the rest of the mattress. This creates a steady flow of water leaving the bed without loosing the siphon. When the bed is empty, remove the garden hose from the drain plug and immediately replace the plug so air cannot enter the mattress. This makes the job of adding water to your mattress easier when you are ready to refill it. If you need to drain a waterbed that resides in a basement, the above method will not work because you most likely will not be able to get a siphon started since the basement is lower than your lawn. In this case, you can use an adapter on a wet-dry vacuum and remove the water from the mattress from the suction of the vacuum. After the canister is full, turn off the vacuum, disconnect it, pour the water out and then reconnect it to remove all the water possible one canister at a time.